The start of December began a little series featuring some of my most talented friends. I have many so this series may take awhile. 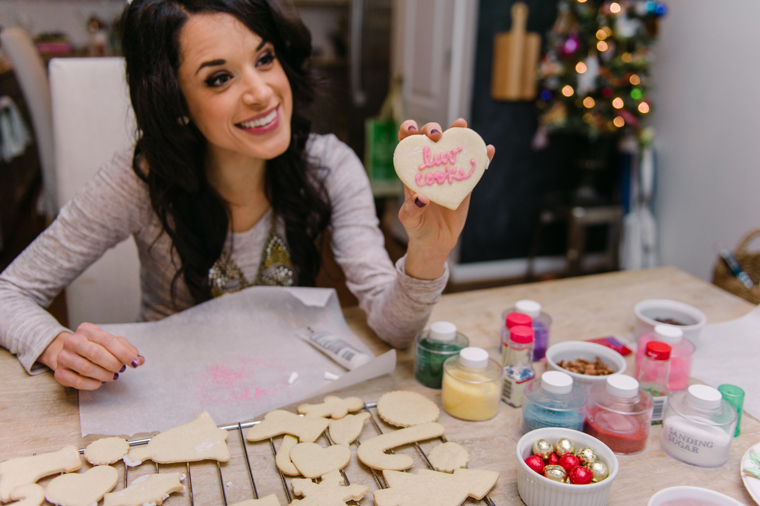 Today I have Callie of Luv Cooks sharing a family favorite, cookie decorating! This activity has become somewhat of a tradition over the years. We do them with friends, family, and of course the neighbors are always overjoyed to get what I like to refer to as the "creative" cookie. Ha. Callie has many talents, but one of her greatest pleasures is cooking for others. She has a southern charm that simply can't be matched and a heart of gold. Having her in my life has truly made me a better person. Oh, and the kiddos LUV her. Needless to say this past Sunday we had a blast decorating cookies with Callie. She also quickly learned the children, especially mine, go all out when it comes to decorating. Needless to say I owe her a big Williams & Sonoma gift card. Can you tell which are Callie's and with are Ellie's & KJ's? Ha. Also I may be the last to hear of Sanding Sugar, but it really is so fun. A little icing and a light dusting of the sugar makes it sparkle. Callie's came from Willians & Sonoma. I would LOVE to try a gold too. Of course, what is decorating cookies without being able to eat some along the way! The cookies make for great teacher, neighbor, and really anyone who may need an extra treat gift. Once the icing is dry they can easily be put in cellophane bags and tied with a pretty bow. So easy and fun! The bags can be found in most craft stores and of course etsy always comes to the rescue. Thank you Callie for such a fun day! To get the full recipie for the cookies with and without the glaze you can go to Callie's blog, Luv Cooks. I hear they were delicious! Next time gluten free ones, but of course they would all be for me.